(Phys.org)—Prof. Hagai Netzer of Tel Aviv University has developed a method that uses black holes to measure distances of billions of light years with a high degree of accuracy. The ability to measure these distances will allow scientists to see further into the past of the universe than ever before. A few years ago, researchers revealed that the universe is expanding at a much faster rate than originally believed—a discovery that earned a Nobel Prize in 2011. But measuring the rate of this acceleration over large distances is still challenging and problematic. Now, Prof. Netzer of Tel Aviv University's School of Physics and Astronomy, along with Jian-Min Wang, Pu Du and Chen Hu of the Institute of High Energy Physics of the Chinese Academy of Sciences and Dr. David Valls-Gabaud of the Observatoire de Paris, has developed a method with the potential to measure distances of billions of light years with a high degree of accuracy. The method uses certain types of active black holes that lie at the center of many galaxies. The ability to measure very long distances translates into seeing further into the past of the universe—and being able to estimate its rate of expansion at a very young age. Their process is the equivalent of determining the length of rainbow by counting the coins in the pot at the end of the rainbow. No, it's like measuring the nervous system activity that makes your hands type that kind of nonsense, and comparing that to the level of activity in a normal person, then using the difference to determine how retarded you are. Please, if you can, take advantage of this - see link - with respect to the idea put forth from Prof. Netzer in this article. I haven't seen the original paper yet but I would expect that to be a standard candle, it needs to be in a limiting regime. The cloud is relatively small so should produce a useful flare but far from the maximum possible. Does the 'usefulness' of the flare mean the flare's intensity will be directly proportional to the mass of the black hole? No, it will depend on the size of the cloud. For the specific type of black holes targeted in this work, the amount of radiation emitted as the object draws matter into itself is actually proportional to its mass, say the researchers. Therefore, long-established methods to measure this mass can be used to estimate the amount of radiation involved. A misinterpretation on my part. Our own black hole isn't emitting any radiation at the moment, when the cloud hits it will, yet the mass of the BH hasn't changed. The intensity depends both on the mass of the BH and the amount of matter absorbed. We can't know the latter for a distant quasar unless there is some regulating process such as an upper limit which is what I expect the paper addresses (but I haven't seen it). What will the flare reveal? Mass? Distance? Duration, efficiency, cloud mass, possibly accretion disc dynamics, disc temperature profile, spectral profile and if we're lucky there may be transient jets. We'll have to wait and see what we can learn. When they are monitoring radiation emitted from a distant galaxy billions of light years away, they are looking at a galaxy billions of years back in time. If that galaxy is seen as accelerating, I would interpret that as that galaxy was accelerating billions of years back in time. How do they say that the distant galaxy is accelerating now ? Would someone be able to explain it please? It's a counter intuitive concept, but I'll try. Yes, we are seeing the galaxy as it was billions of years ago. But we are not "seeing" IT accelerating. It is "where" it always was. What we are seeing is the space separating that galaxy and us expanding, faster. The proper motion of the galaxy (or any other object) is not the same as the "apparent" motion due the expansion of space. That's the shortest explanation I can give, it's counter intuitive, so it's not enough. Google up Standard Cosmological model & ya'll get many sources that will fill in the mechanisms and details of "how". That about says it for the entire theory, Ockham be damned! That must be why Occam won all those hundreds of Nobel Prizes while everyone else had to settle for just one (or a rare two). Mr. Occam was also very quick with the "It must be God" explanation when he should have said "I don't understand it". 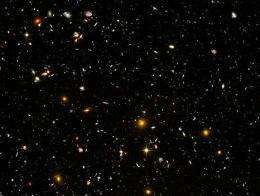 How do they say that the distant galaxy is accelerating now ? Would someone be able to explain it please? As Q-Star says, it is a bit counter-intuitive. We can't measure the expansion rate directly, what we can do is fit the apparent brightness to the redshift and compare that to a model based on the equations for gravity (general relativity) like throwing a torch in the air and deciding determining how fast it was thrown by how dim it appears some time later. We know the rate today from the Hubble Constant. If we project that back some time (based on redshift), the distant object should have a certain brightness. In fact it is dimmer which means that at that time it was farther away, hence it must have been moving slower for some of the time since and speeded up recently. We can't know the latter for a distant quasar unless there is some regulating process such as an upper limit which is what I expect the paper addresses (but I haven't seen it). As I suggested, the approach is based on identifying super-Eddington accretion. In that mode, the rate of inflow is limited by the resulting outgoing disc radiation hence we can find its absolute magnitude.